At last, I stopped procrastinating (very good at that ) and progress with the Byers-worm/EQ project. I have high hopes for this. Can't afford a high-end mount, and hunted down the Byers worm gears. 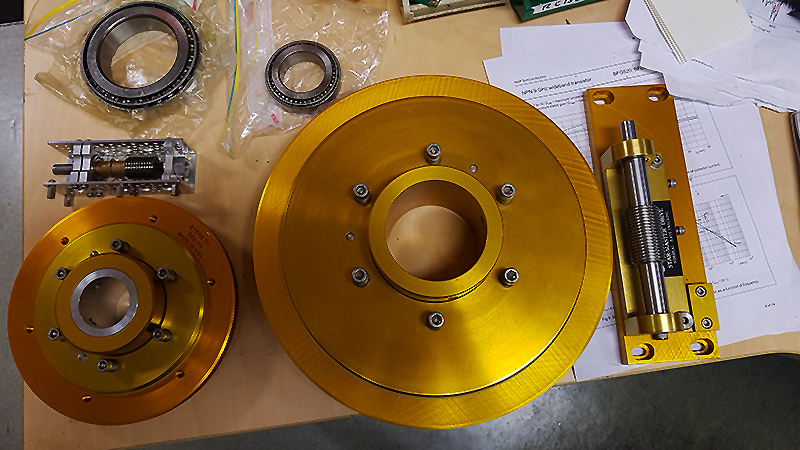 11" for RA and 6" for the DEC.
All plates and bearing housing is alu... the shafts are steel. The tapered roller bearings ID is 70mm/North and 40mm/South. The worms will be driven by EqDrive steppers direct and controlled by EQMOD. The C14HD will ride on this with a 80ED and perhaps a 6RC. Not sure what to expect from this... Byers worm gear has a good reputation. Did a lot of research ... not found much plan or drawing. So I tried to keep it simple, but 'robust' ... if that's the right word. Going to be on a pier in an obsy... don't care of the weight. My friends help me with the machining and did the drawings. Before the machining, I like to ask you to comment on the design. I'll welcome any input/criticism, suggestions. Your design looks great. You have addressed all the issues that I have run into in my system. Just remember you always end up wanting to put more weight on them mount than you originally expected. If it is intended for a permanent mount, dont be afraid to make it heaver. Of course if you intend it to be portable, not a good idea. The heart of the GEM looks good: large, tapered shafts; large ball bearings; and of course those beautiful and large Byers gears. 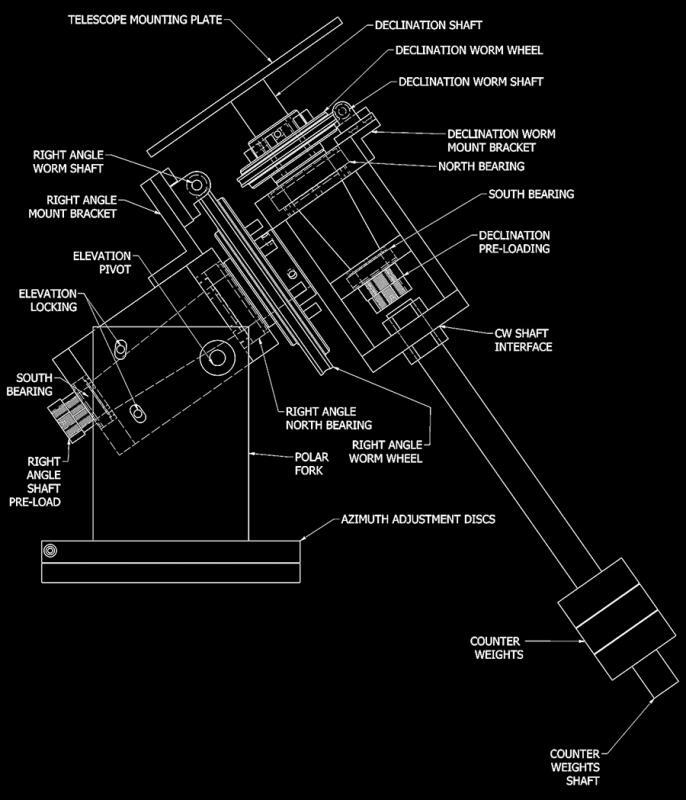 The drawing does not provide dimension and thickness details but based on what I see I would recommend one important change: if it's not too late, you should consider beefing up the joint between the top of the declination shaft and the plate where the OTA attaches to the mounting. It looks disproportionately thin and flimsy. You should consider a 3/4 inch thick aluminium plate with a large collar welded to the underside where it attaches to the declination shaft. I don't know if you are making the housing out of aluminium (anodized would be nice) but I recommend a stainless steel shaft for the dec counterweight. It looks nicer and lasts forever. One last thing: you might want to look up an article in Sky and Telescope on Ralph Nye's 16 inch newtonian telescope. Unfortunately I can't remember the date of publication but I think it was in the late '70's or early '80's. His GEM equatorial mount is similar to what you are undertaking. It was very well written and illustrated. Might provide some ideas on how a successful build was done. Mark, the mount will be permanent. Pierre, yes agree... the top plate and interface to DEC shaft yet to be finalized. The scope(s) will be in a cradle and secured to the plate. All shaft is steel, rest is alu with various thickness.... 20mm plates and 40mm for the bearing housings. Edited by Space99, 21 March 2019 - 06:30 PM. I'd like to see the Dec shaft under scope mounting plate shortened. The closer you can get the scope to the RA axis, the stiffer the mount will be. This also reduces the amount of counterweight required, which then increases the load the mount can carry. Moving the RA worm to the bottom should allow this, if you have room. This is very good advise and I wish I could have done that on my mount. I had to machine a 4 inch spacer so that I could move the DEC shaft out father so that the equipment would clear the lower part of the pier. Take the clutch off the RA wheel and make the worm block removable or pivotable for balance. The clutch wastes useful shaft diameter at this location. Use servos because you can balance via current draw. The Boller & Chivens large observatory mounts used a pivoting worm block to let you balance by partially disengaging the worm. There are no clutches. Use a Fenner b-loc coupler to connect to the dec shaft at the OTA mounting plate. It is critical that the worm block to mechanical ground is extremely stiff. Calculate how much deflection of that bracket equals one arc second. It is tiny. Looks good in general. Edited by 555aaa, 22 March 2019 - 01:14 PM. the old designs use the worm gear location at the bottom of the shafts. But all new designs like AP900, 1200 etc is on the top of the shafts. I guess for better Go-To. This is the reason I placed it to the top. Tried to copy AP (without seen whats inside). The penalty for that is the over-hung Dec, more weight. Too scared to remove the clutches, and the Byers gear has a big ID hub with teflon(?) bearing. That bearing need to replicated accurately, plus the wheel need to be supported with thrust-bearing without the current clutch assembly? I'll explore the Fenner coupler, tnx for the suggestion. Re worm block. Yes, I can see this is very important. This is the reason I modified the original Byers single end worm mount with the addition of a screw-ball to support both end. Not sure how will work out. The RA has a nice spring loaded worm block. I hope this will work OK.